For a Region to attain 20, 30, 40, 50 or more years of Porsche fellowship means that several generations of enthusiasts have selflessly given of their time and energy to sustain and nurture the organization to its present standing. Indeed, the Porsche car may be the tie that binds us all, but it is the membership’s commitment to the club and to one another that has enabled the growth and success of our region – both in its past and for its future. The First Settlers Region anniversary celebrations recognize these longstanding commitments and friendships. Let’s Celebrate our 60th! The Porsche Club of America, First Settlers Region desires the comfort of good friends and good conversation. We praise to a fault the world’s finest automobile. With those attributes, our club membership grew to its highest number to-date – 700 Primary Members in 2018. We are a diverse group and our members come from all walks of life and from students to retirees. No matter where you call home, there is a PCA Region near you. Arranged into 14 Zones, there are 145 local Regions across the United States and Canada. The First Settlers Region is part of Zone 2. 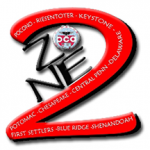 Zone 2 is made up of 10 Porsche Club of America Regions covering the Mid-Atlantic Area including: Pennsylvania, Delaware, Maryland, District of Columbia, Virginia, and West Virginia. We know the unbridled joy that owning a Porsche can provide, and we’ve built a community around that very feeling. Great things start small, and the Porsche Club of America is no different. It began with one man, Bill Sholar, who was a commercial artist in the Washington, D.C. area in the early 1950s. He bought a new 1953 356 Coupe, and, as time passed, he met other Porsches on the road and flashed his lights at them in silent greeting. By late 1954, Sholar was convinced that a more personal meeting would be appropriate with other Porsche owners to discuss the positive and the not-so-positive aspects of driving the infrequently encountered marque. Hence the Porsche Club of America was born. As more and more members joined outside the Washington, D.C. area, Regions were formed in other communities. The original Washington, D.C. group eventually became Potomac Region, which remained the hub of activities. First appearing in December 1955, the Club’s monthly magazine, Porsche Panorama, kept all members updated on the latest technical information, factory news, and events. We race each other, show our prized possessions, and conduct rallies, autocrosses and tours. The club sponsors driver education, Porsche restoration, and technical sessions. Each of us know our Porsche – or Porsches if we’re lucky – inside and out.